Nationality: American. Born: George Ranft in New York City, 26 September 1895. Family: Married Grayce Mulrooney, 1923 (separated 1923, died 1970). Career: From age 13, worked as boxer, pool player, dancer; 1919—dancer in vaudeville, in the next few years touring on the Orpheum and Keith Circuits; also dancer at Jimmy Durante's Club Durante and Texas Guinan's El Fey Club; 1925—Broadway debut in The City Chap ; 1929—film debut in Queen of the Nightclubs with Texas Guinan; early 1930s—several roles as gangsters in films, with much publicity concerning his friendship with nonfictional gangsters; 1932—classical role in Scarface , contract with Paramount, then in 1939 contract with Warner Brothers, and freelance after 1942; organized sports show for entertaining the troops during World War II; 1953—in TV series I'm the Law ; early 1960s—public relations director for Consumer Marts stores; 1966–67—host of Colony Club casino, London, but banned from England as persona non grata because of alleged gangster connections. Died: In Los Angeles, 24 November 1980. Interview with R. Donaldson, in Movie Classic Magazine , June 1932. "You've Got to Be Tough in Hollywood," in Films and Filming (London), July 1962. Yablonsky, Lewis, George Raft , New York, 1974. Parish, James Robert, and Steven Whitney, The George Raft File: The Unauthorized Biography , New York, 1974. Beaver, J., "George Raft," in Films in Review (New York), April 1978. Obituary, in Image et Son , January 1981. Sikov, E., "George Raft," in Architectural Digest (Los Angeles), April 1996. 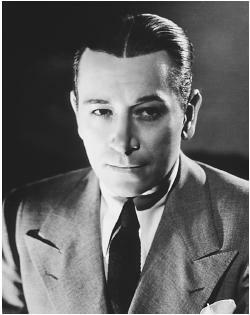 George Raft was instrumental in the development of the character of the hardboiled gangster, a character that became a standard of the American cinema for decades. In fact, he fit the type so well that his rather shady background became the object of endless speculation, and both the public and the studio refused to accept him in any but the most indistinguishable tough-guy parts. Perhaps he filled these parts even too well, for he never became as popular or sympathetic as James Cagney or Humphrey Bogart, and, in his apparent effort to overcome the image, he rejected several roles that turned Bogart into a major star: The Maltese Falcon , Casablanca , and High Sierra . Raft began his career as a dancer in clubs and on the stage, and although his physical grace was evident in even the most undignified roles and the most violent situations, his musical talent was exploited in very few of his films. Once his part as Paul Muni's coin-tossing sidekick in Howard Hawks's Scarface had established his career and his image, Raft played variations on that role as a Paramount contract player throughout the 1930s and then in a series of increasingly minor melodramas for less prestigious studios. Finally, when advancing age and the changing demands of the audience ended his leading roles once and for all, he turned to self-caricature, often appearing as himself in miniscule cameo parts. In Hollywood, a strong personal image is usually seen as a lack of versatility, and George Raft's career is illustrative of this tendency which has limited many actors even at the height of their popularity. While few of his films were successful in any way, either with audiences or with the critics, Raft's real failure was in his inability to outgrow the character that he helped to create.